7,5,3 from the center circle. (2) The height of the target center is 160 cm(5.2feet). 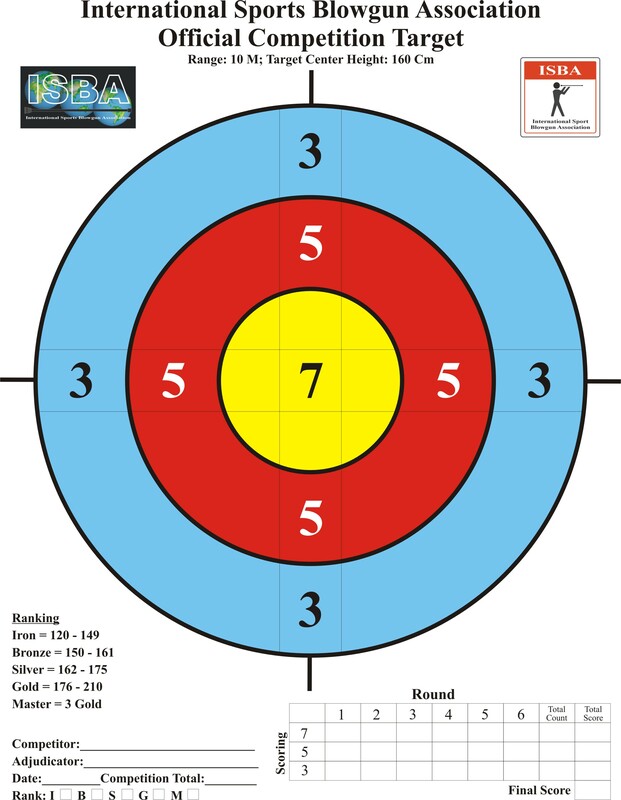 (4) The player shoots 5 darts in one round.One competition is 6 round. points beyond the time is not counted. checking time by the marker. then the player can pull darts off from the target mat. (7) The pipe is 120 cm(47.2 inches) long or shoｒter . The pipe caliber is free. Pipe accesary and any type of dart are available. (8) When darts hit the circle line the point of heigher point zone is counted. whithen the shooting line he can blow it again.Only the second point is recorded. If he cann't retrieve the dart the point is counted as zero. (11) 15 minuits before the competition players can try to shoot three darts. (12) Other problems should be talked and solved by operator,representatives and players. (13) Rule of field match is written in another page. (14) At the competition smoking is not allowed. (18) When player shot 2 cone darts together by mistake,it is regarded as one dart. (20) It is recommended to fix wire ring target on sponge backstop at official competiton. :◎Old IFA master (6 dan)* is abolished. Titanium,Platinium,Diamond are added according to the international rule. Auther Dr.Hironori Higuchi & Dr.Masayuki Hayashi. This book is not sold now. 20. 1999 Auther Dr.Masayuki Hayashi.There written shooting distanc is 8m or 10m. 1.Continual hit record means that the the arrows hit continuing in circle 7 points. shoot until he hits other than 7 points. 1.The center of 24 cm in diameter target circle is set at 160 cm above the floor. 2.The player shoots three paper cones for one round. shoot another three darts at more far distance. 10.The hight is 160 cm(4.8 feets). Shooting line is 10 meter(11 yard) away from target. 2. Make a ring by the line and hang it by U type pin on the sponge mat. 4. When the dart which rebounced after hitting target is effective. 5. When dart hit the target but target did not drop.The dart is effective. 6. When the dart rebounced and it was unclear whether it hit the target or not. The second shooting is counted. 7. Entrant can chose the first matchbox which he shoots. 8. Entrant can aim the next matchbox after the first matchbox was dropped. player can pull darts off with approval of marker. 10. Entrant can stop shooting anytime if he gave up. 11. Entrant can clean the inside of pipe whenever he wants. 2.At the 3 spots there are 4 targets,the player shoots 4 darts to a target. He shoots 16 darts at each spot. Distance of 4 targets are 9 m at A,11 m at B,13 m at C and one target 15 m at D.
3.The order of the shooting is at first A and B,at the next spot C and D shoot first. New ASBA　is reopened by Mr. Brule Bell.